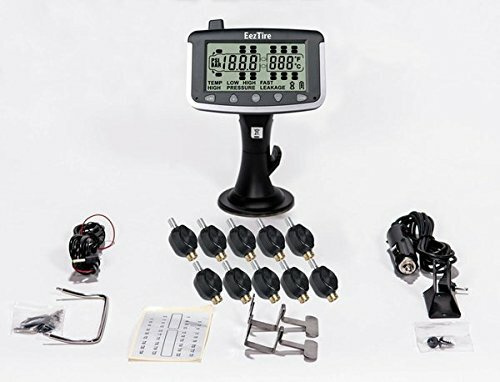 EEZTIRE T515/SP TIRE PRESSURE AND TEMPERATURE MONITORING SYSTEM One of the largest monitors on the market for a TPMS system - a full 3 1/2 inches in diameter! Why Choose Our Model over Another We have designed and developed top of the line, new age wireless tire pressure monitoring systems designed for the RV and Transportation Industry. Our system is designed as a safety feature to allow drivers to monitor both the tire pressure and temperature of the tires on their RV, Trailers or Tow Vehicle. The system comes with a monitor that can handle up to 22 wheels up to 210 psi if needed and the sensors have replaceable batteries. Monitor Features • Reliable and easy to install • Large LCD screen. Built-in rechargeable lithium battery • Automatic backlight. • Configurable high/low pressure warnings. • Configurable high temperature warnings. • Visible and audible alerts. • Selectable pressure units. • Monitors up to 22 tires maximum. • Long range between sensors and monitor • Per axle measurements can be configured on the tractor Sensor Features • 1-2 Year Battery Life, Replaceable Batteries • Light Weight - No Need For Rebalancing Tires • Monitors Both Pressure and Temperature • Anti-theft design NOTE FOR TOW VEHICLES: We find that many times the Flow-Through sensors which are approx. 2 1/2 inches long and 1 inch in diameter are too long and stick out to far on the tow vehicle. They can get damaged if you clip a curb on a turn. You may also want to look at the diameter of the holes on the front rims of your rig. If you are over 50 FT long you may also want to consider using a booster/repeater to ensure you do not have signal drop off or interruption. Click on our store to see the booster/repeater.